A user terribly entangled in Vine. Photo provided by Carl Fonticella. When Twitter first launched Vine in January 2013, it came across as a novelty. Users quickly gobbled up the app as their newest obsession and began collecting sliced clips of everything that moved. However, as the first Vines came in, often as random frames of everyday activities like eating PB & J sandwich, people labeled the social media as stupid. Many saw no difference between Vine and animated gifs, and thus wrote it off as utter nonsense. Still, while the ignorant naysayers scoffed at what they saw as six seconds of wasted time, Vine began expanding like wildfire. Videos became more deliberate, crafted and put together. 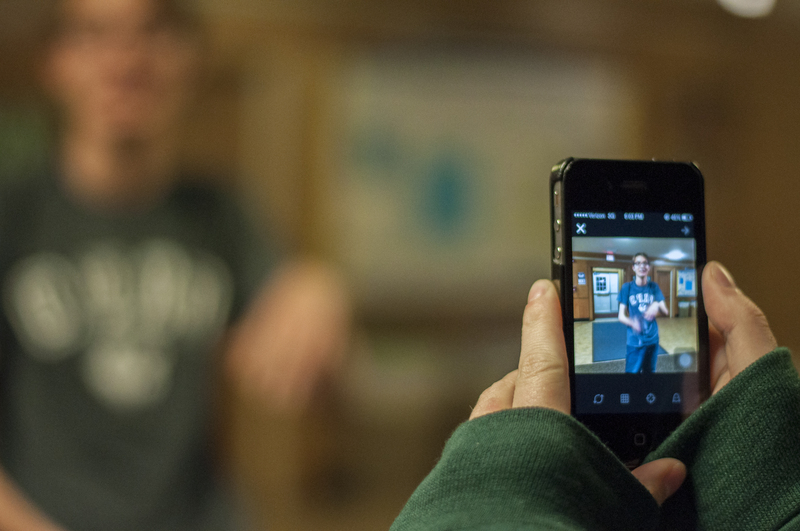 Thanks to Twitter’s tech savvy mindset of making Vine shareable on a variety of mediums, the app had the unique advantage to grow using existing social media. An avid video maker since a little kid, Paul found in Vine the perfect medium to share his brand of humor and have it stick with the world. Inspired by famous Viner Nicolas Megalis’ Vine “Gummy Money,” Paul saw the potential of the service and began taking his videos seriously. A creative storm unfurled. The Vines from filming his pet bird to an overflowing catalog of hilarity filled with short-short backflips and sudden puns that his followers watch for hours on end. All of his Vines are meticulously made, and it sometimes requires countless takes to create a perfect product. Paul, Megalis, and other famous Viners like Eric Dunn and Curtis Lepore have unlocked Vine’s power to entertain, which is what the majority of users go to it for. Followers flock to these guys’ Vines by the thousands to get their daily dose of laughs. After all, who doesn’t like watching kittens freaking out at dubstep drops or a bride-to-be getting caught on a smack cam? However, they are not ordinary viral videos. Vine has broken into new territory allowing viewers to enjoy multimedia without traditional limitations. News organizations have also tried to expand journalism coverage through Vine. News station KSDK-TV in St. Louis uses Vine to research stories, post weather updates and show what is happening in the control room. Forward organizations like European news channel Euronews and Politico use Vine to highlight trending stories and announce top headlines. Documenting breaking news with the Vine, Stewart says, would prove to be a difficult challenge. For the most part, big-time American news organizations have scratched their heads and hidden their heads under the covers when it comes using Vine. Instead of producing anything of quality and substance, the content shares more in common with iPhone videos than actual news. The Washington Post and the Wall Street Journal both have Vine accounts, yet neither publication has posted anything. Meanwhile, MSNBC believes that what its viewers really want is their hosts dancing at corporate parties. Other uses for Vine are beginning to emerge, though. As social media expert Hans Meyer points out, people need time to change and to learn how to use social media effectively. While Vine is not even a year old and is still in its growing stages, it has tremendous potential to be something more than a service to share video clips with others. With the 21st century’s “gotta have it now” mentality, the possibilities are endless. Who knows? While the cute cats and pranks are here to stay, maybe ESPN will also be live-vining scores of football games and showing touchdown dances. Or perhaps NASDAQ will be putting out Vines detailing the performance of blue-chip stocks. Either way, Vine proves that six seconds, in the right hands, is enough time to do just about anything. Living with a legend: a Vine legend, that is.